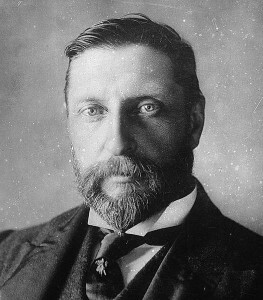 “The Grand Trunk Pacific Railroad wants, if the Geogaphical Board of Canada consents, to name a great Alp in the Rockies after me — Sir Rider Mountain and Haggard Glacier, a great and unusual compliment,” wrote the British novelist Henry Rider Haggard (1856-1925) during his train trip from Prince Rupert to Edmonton in July, 1916. “I saw it. It is a wonderful and magnificent Alp, some ten thousand feet high and measuring many miles around its base. Snow lies on its summit even in summer and it has deep, ripped glaciers and fir-clad ravines upon its flanks, while the crest has some resemblance to a Lion.” The Geographical Board consented to the recommendation. almost lifelong work for the British Empire in various governmental positions. John Robert Colombo states that Alan Rayburn, executive secretary of Canada’s geographical names secretariat, told him that “the man responsible for this rash of naming was severly reprimanded for promising Sir Rider that one or other of these three features would have his name” — presumably in reference to the customary restrictions in assigning official names. The mountain was first reported in 1915 by a party including Samuel P. Fay of Boston and guide Fred Brewster of Jasper. Haggard, Henry Rider. Days of my life.